VATICAN CITY (CNS) — Pope Francis has accepted the resignation of 69-year-old Auxiliary Bishop Alexander Salazar of Los Angeles after the archdiocese’s independent Clergy Misconduct Oversight Board recommended he not be allowed to minister because of an allegation of sexual misconduct with a minor in the 1990s. 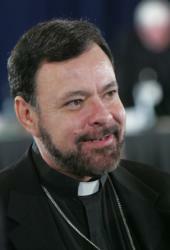 “Since he was a bishop at the time the allegation was received, the archdiocese referred the matter to the Congregation for the Doctrine of the Faith at the Holy See, which conducted an investigation and imposed certain precautionary measures on the ministry of Bishop Salazar,” Archbishop Gomez said. Educated in Catholic elementary and high schools in the Los Angeles Archdiocese, he studied at California State University, Los Angeles and at Immaculate Heart College in Los Angeles, where he earned a bachelor’s degree in bilingual studies in 1978. In 1977, he began studies at St. John’s Seminary in Camarillo and was ordained a priest of the Archdiocese of Los Angeles June 16, 1984.